Think all fairy tales are brightly-colored, light-hearted, and filled with Disney tunes? Think again! Join us from 2-4:30pm for an imaginative and creative workshop that’s part of our 2019 NICE project! Wearing your fairy-themed clothing to the workshops is encouraged! This year, our theme is Folklore and Fairy Tales ~ Beyond the Fairy Dust, and our passages come from these four folklore and fairy tales: The Story of Hunahpú and Xbalanqué (in Popul Vuh, trans. Ximénez, c. 1700-1715), The Little Mermaid (Hans Christian Anderson, 1836), The Ballad of Tam Lin (c. 1549), and Hansel and Gretel (The Brothers Grimm, 1812). 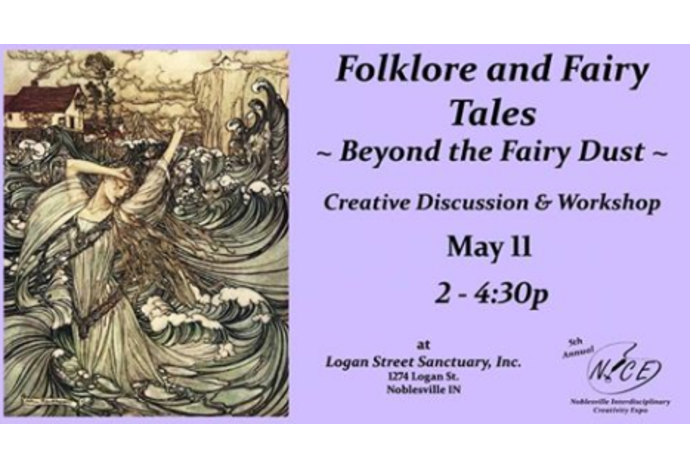 We’re looking at these original folklore stories and fairy tales through a modern lens, to relate them to today’s world with fresh insights. The workshops focus discussion on the original themes, which are usually somewhat darker than what we find in translations/retellings and films in popular culture over time. 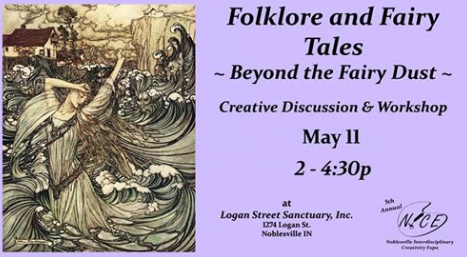 Each workshop offers a different discussion focus, but both workshops offer opportunities for people to discuss the stories and selected passages in terms of imagery, symbolism, and cultural context, and we connect to them in fresh new ways, relevant to personal experiences. Workshops also make time for and encourage people to create new art, in all mediums and genres, inspired the selected passages. All mediums & genres are welcome (writing, 2D art, 3D art, music/songwriting, etc). Bring your own artistic tools (paper, laptops, paints, etc) or use what we provide: this year, we’ll guide the creation of abstract art and provide 6x6 canvases and acrylic paints. Workshop attendees are not required to attend or present at the Oct 5 event, but we encourage it! Find out more about our annual NICE project and this year’s selections on our website: http://loganstreetsanctuary.org/nice-noblesville-interdisciplinary-creativity-expo. Your emailed receipt acts as your confirmation of registration.